With the weather being so on and off lately, I find myself reaching for my sweaters. I know, it’s not even October but we’ve already had some chilly days and I’m not ready to pull out my jackets just yet. 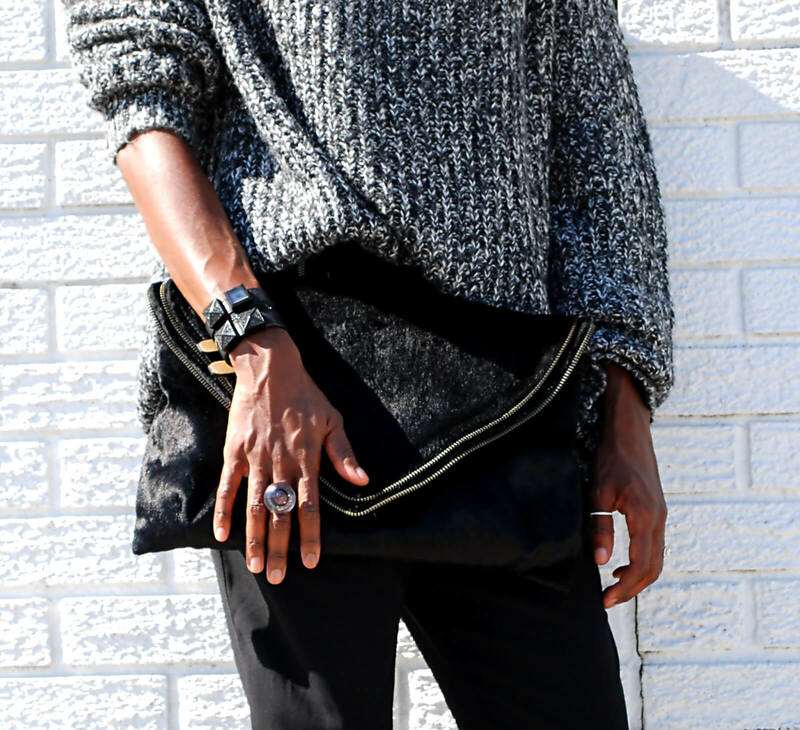 Case in point, this oversized/slouchy sweater. It looks super warm but the knit is surprisingly light which makes it a perfect substitute for a coat but not too heavy so that I don’t melt in the sun. Personally, anytime I wear an oversized sweater, I like to pair it with leather leggings or slouchy pants. But I do think they also look great paired with pencil skirts, cropped pants and denim shorts (or any other type of shorts). If you’re feeling daring, give thigh high socks a try. And if you’re worried about feeling too bulky in it, try belting your sweater to give it a little more definition. Do you guys like wearing oversized sweaters? Love that sweater and your accessories are just perfect! You look great! It's as if that jersey was made for those trousers. Hi Jackie, I absolutely adore this look! Love the over sized sweater! You never cease to amaze me! Also, wearing black is my fave, and you pull it off like no other! You look amazing! Love the colors! Love this look!! In love with your sweater. I'm in love with this outfit! The sweater is everything!! Luv ur booties! Great with those pants! I love oversized sweaters and that its starting to be cool enough for them. Love the combination of the slouchy pants with your cozy sweater. You cannot beat an oversized sweater. You make it look so chic with your booties. This look is so chic! i love it! Beautiful look sis as always! Oversized sweaters are one of my go-to Fall items. You are rocking it so well! You look smashing as always sweetie. Love the booties. Take care of you. This chunk knit is super chic! Love the look! You are so darn stylish I can't even handle it!! you look great wearing oversize sweater!! You are so gorgeous and I love everything about your outfit! LOVE your sweater! I also think the pants are a great match and I love the zipper details on the pockets. great look, loving the sweater!!! Stunning, stunning, stunning! a perfect Fall look! Love your oversize sweater, gorgeous look. Ok, I love oversized sweaters and could literally live in them in the fall and winter. And I love how you've paired yours with those pants. You look great! Hi dear, so nice look!!! I love the clutch!!! I hate Fall/Winter, but I do love the fashion. - Especially oversized pullis!! They're so comfortable and cosy. I LOVE this oversized grey sweater. I must find one before the Winter ends. Cute look!